After spending a few days exploring Coonamble and The Pilliga, we headed east to Coonabarabran – the gateway to the Warrumbungle Mountains. Coonabarabran in Central New South Wales is a gorgeous little town. We had driven through it countless times over the last 20 years but never had the opportunity to stay. 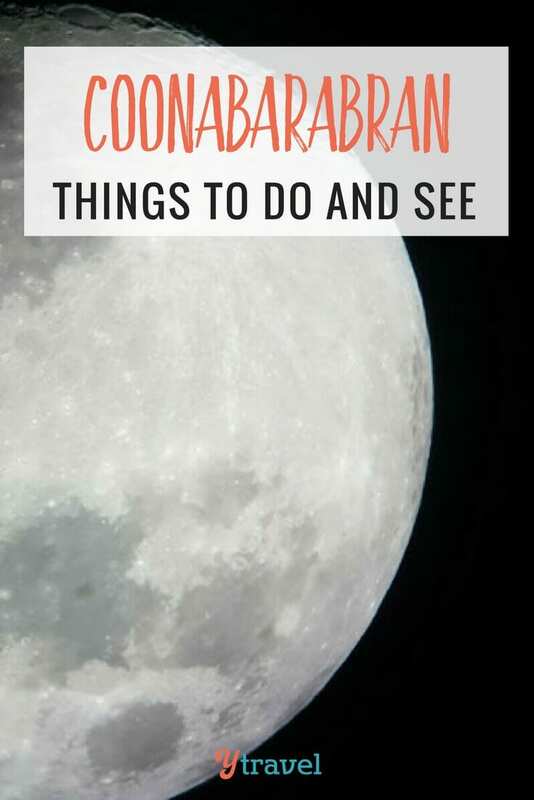 As we discovered, Coonabarabran is the ideal spot to base yourself if you want to do a little ‘star gazing’ or explore the Warrumbungle National Park. Just a short one and a half hour drive from Dubbo, along the Newell Highway, Coonabarabran is a town whose history dates back to the mid-1800s. To the north is the vast Pilliga State Forest and to the west is the Warrumbungle National Park. Known as The Astronomy Capital of Australia, it’s not hard to see why when you take a look at the night sky. Whenever we visit a new area for the first time, we like to call into the local Visitor Information Centre. These centres are usually staffed by locals. Some are even volunteers, so you know they are both passionate and knowledgeable about their local area. After gathering up some info on the Coonabarabran area, we headed into the Australian Museum Diprotodon Exhibition which is housed in the rear of the Centre. The Diprotodon was a huge marsupial, a little like a large wombat that wandered the Earth over 30,000 years ago. 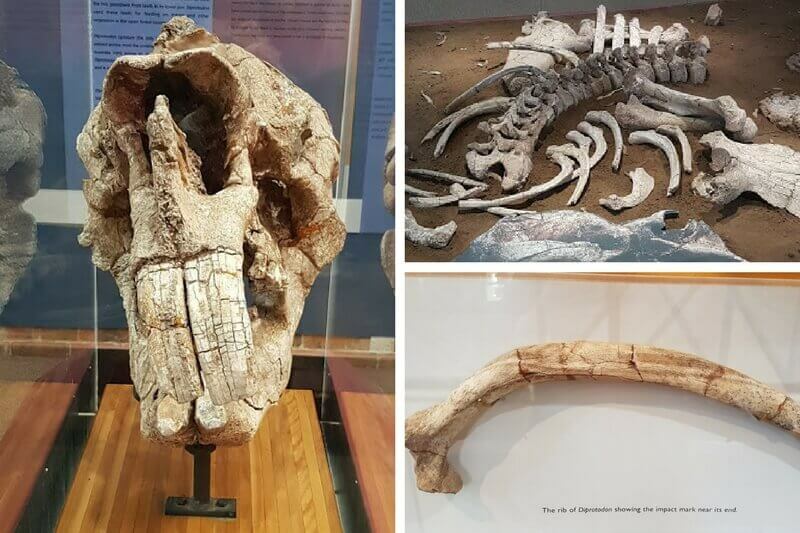 An almost complete Diprotodon skeleton was found near Coonabarabran in 1979. The Diprotodon was a huge marsupial, a little like a large wombat that wandered the Earth over 30,000 years ago. An almost complete Diprotodon skeleton was found near Coonabarabran in 1979. The Centre also houses the Aboriginal Lands Council Keeping Place. This display shows the connection of the local Aboriginal people – the Gamilaroi people – to the land. I was fascinated with the depiction of some of their Dreamtime stories. I especially enjoyed the story of Yowie – the Spirit of Death and the Southern Cross. I was fascinated with the depiction of some of their Dreamtime stories. I especially enjoyed the story of Yowie – the Spirit of Death and the Southern Cross. Located on Mt Woorut, just under 30 kilometres from town, there are 16 research instruments at Siding Spring. This includes the Anglo Australian Telescope, which is the largest optical telescope in Australia. Siding Spring was selected as the perfect spot for radio astronomy in the 1960s because of the dark skies and lack of turbulence in the area. Siding Spring was selected as the perfect spot for radio astronomy in the 1960s because of the dark skies and lack of turbulence in the area. As Siding Spring is an operational research facility, there are areas that have restricted access to the public. 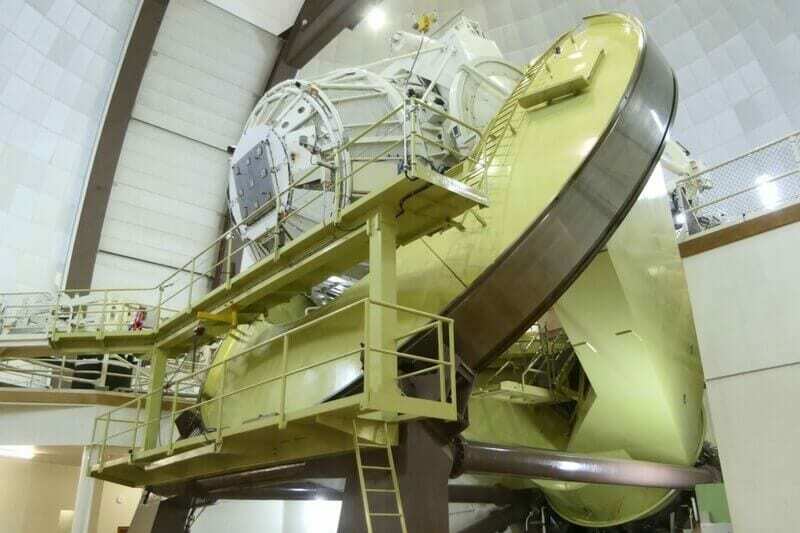 But you can climb all the way to the top viewing platform where you are able to observe the giant telescope. It is four flights up or as we discovered after we reached the top – you can take the lift! It is a massive piece of equipment and you can’t help but marvel at the technology that allows us to look deep into outer space. In the Exploratory Centre, you can learn more at the hands-on exhibition. Entry is just $13.50 per family. There is also a coffee shop and small gift shop as well. Outside you will find some picnic tables that have spectacular views of the Warrumbungles. Siding Spring is open to the public Monday to Saturday from 10am to 4pm and Sunday from 10am to 2pm. Entry is free. As Siding Spring is a research facility, it is not open to the public at night time. Luckily there are a number of private observatories in the area where you can go for a night time viewing. We chose the Warrumbungle Observatory. During the evening we had the opportunity to view the night sky through three different sized telescopes. Our guide Marcus was extremely knowledgeable and was able to answer the many questions that the group had. We were able to observe the stars of the Southern Cross and we learnt that the brightest star in the Southern Cross is called Alpha Crucis. We also learnt that Sirius is the brightest star in the sky and that it is a blue super star. For those who own a Nikon or Canon DSLR camera, these can be attached to the large telescope for the chance to capture a shot of the night sky. 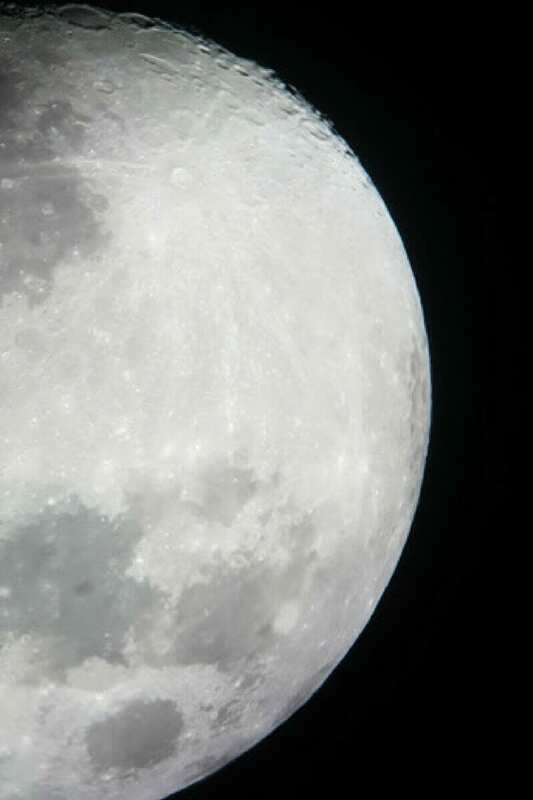 As we don’t own one of those cameras, we tried our luck with our phone and we were able to capture a shot of the moon which was almost full at the time of our visit. Warrumbungle Observatory is great value at just $24.00 for a 90 minute session (which actually went for closer to two hours). If possible, pick a night when the moon is not close to full as you can see stars and other objects more clearly. It is advisable to wear very warm clothing if you are visiting during the cooler months. If you would like to learn more about the geology of the Warrumbungles then a visit to Crystal Kingdom is a must. 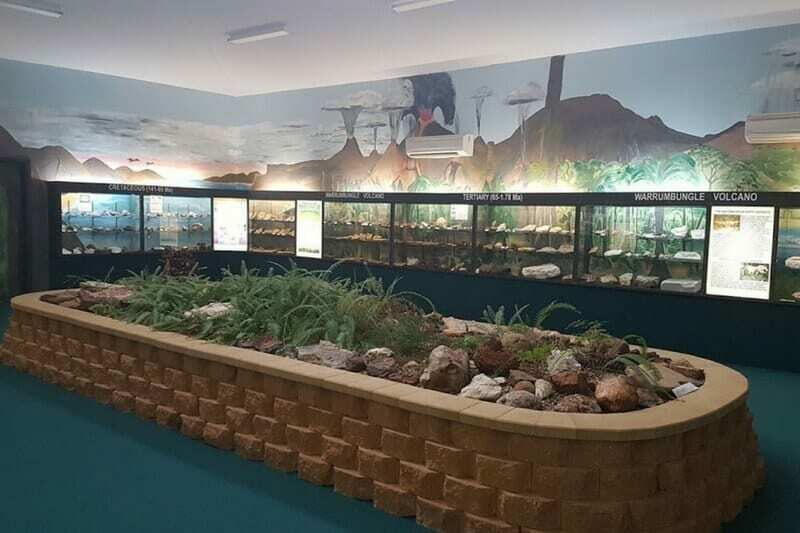 This fascinating display showcases some rare minerals and fossils found in the Warrumbungle Range. The Range consists of two volcanos – the Garrawilla Volcano and the Warrumbungle Volcano. Both have been extinct for many millions of years. The Garrawilla area produced the rare and colourful Zeolite crystals on display, whilst the Warrumbungle volcano produced mainly fossilized specimens. This collection is privately owned by Wolfgang and Nola Bredereck and has been accumulated over the past 50 years. Guided tours are available for a small fee, otherwise, entry is free. 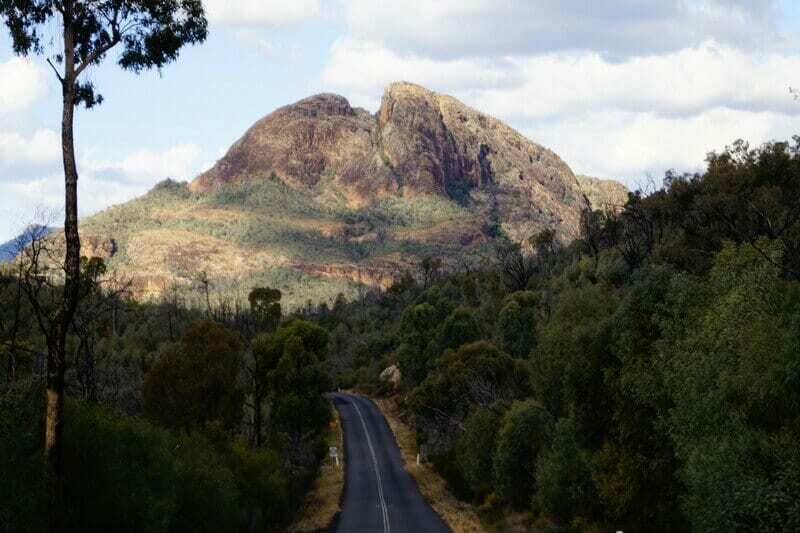 One word can be used to sum up the Warrumbungle National Park at Coonabarabran -SPECTACULAR! From the moment we caught our first glimpse of the rugged peaks we knew we had found a special place. 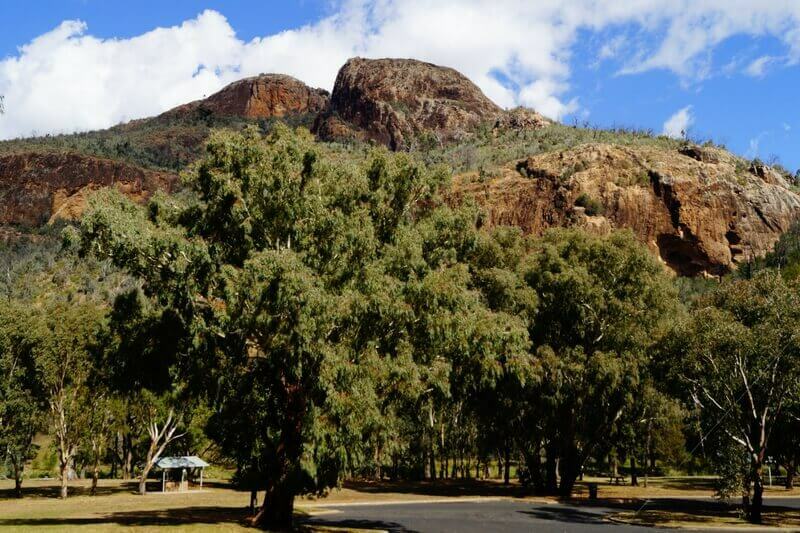 The Warrumbungle National Park covers an area of more than 20,000 hectares. The park was placed on the National Heritage List in 2007 for it’s cultural and geological values. Still recovering from a devastating bushfire in 2013, many of the park’s features are now clearly visible. Although some areas of the park remain closed and some infrastructure is still to be rebuilt, you will not be disappointed with what is available. A visit to the temporary Visitors Centre will get you started with a map and advice on walking tracks and camping areas. The main camping area is called Camp Blackman and has a range of caravan and camp sites available. There are also picnic areas and toilets available. For our first walk, we chose the Wambelong Nature Track. This track is around 1.1 kilometres in length and starts and finishes in the Canyon Picnic Area. The first section of this track is mostly level with a few stairs and a slight incline. You will cross the creek twice before climbing up a number of steep stairs to a level rocky outcrop. From here you are afforded the most amazing views of the whole area, including the Siding Spring Observatory. On this section of the track, you will need to watch out for yellow reflective markers to guide your way back to the bottom. This walk is classed as being of moderate difficulty and will take you at least 45 minutes to complete. It is advisable to wear sturdy walking shoes and carry water with you. No matter what time of day you do this walk you will be guaranteed of seeing plenty of wildlife, including kangaroos, emus, and goats! For our second walk, I chose the Burbie Canyon walk. Although this is a longer walk, at just over two kilometres return, it is mainly flat so it is less strenuous than Wambelong. The walk winds its way through scrubland and then alongside what would be a flowing creek when the area receives rainfall. Tall granite cliffs dominate the opposite side of the creek to the walking track. The walk was shady and cool and frequent bird songs could be heard. The walk was very peaceful and I couldn’t help but feel relaxed and a world away from civilization! There are so many things to do in Coonabarabran, and it’s such a pretty little town. It had a lovely feel to it and I could have stayed for longer. As for the Warrumbungle National Park, we really only skimmed the surface of what is a vast area. There were another 10 walking/hiking tracks that we could have tackled with places to camp along the way. 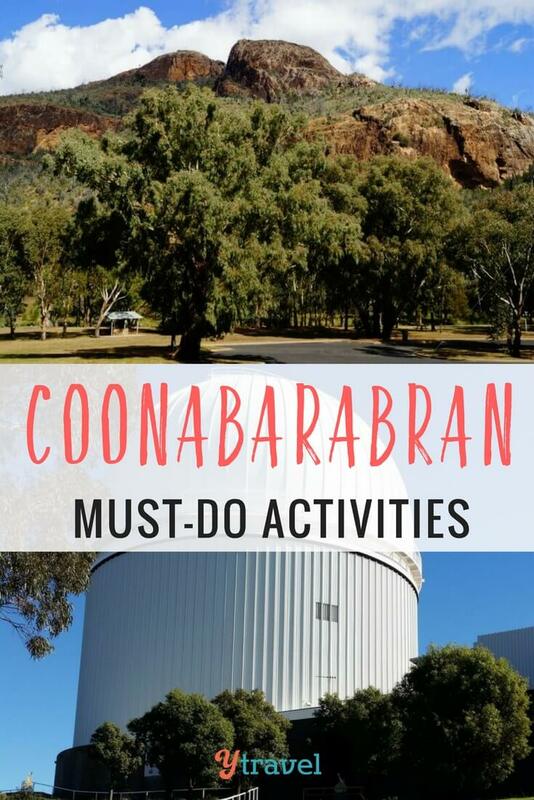 If you are looking for a great place for a family holiday with lots to see and do for everyone, then I think you’ll love Coonabarabran and the Warrumbungles. The arranged tours are definitely a good choice – we did a ‘bikes n wine’ option. Kanonkop is a personal favourite but the others are new to me, for next time! Lucy, what a lovely review… Thank you! We thought we were having you on behalf of Premier Cottages and the Peak District, with possibly a little mention squeezed in somewhere – so an unexpected bonus. We loved meeting you both, and are so glad you enjoyed yourselves. By the way, your photos are fantastic! (Better than ours, so I hope lots of people see your review and can enjoy them too…).